When most people choose to become a vegan or vegetarian, they tend to introduce grains into the diet. However some people react to gluten in ‘modern wheat’ leading inflammation, weight gain and hormonal imbalances. So what do you do if you choose to eat a gluten free vegan/vegetarian diet? Eating good fats and protein provide people with satiety (the feeling of fullness) and sustainable energy, where carbohydrates provide us with short term energy only. Many people who remove animal products from their diet replace them with carbohydrate rich foods such as bread, pastas, rice, legumes and grains. Eating these type of foods can still leave people hungry over time, leading to weight gain, inflammation, hormonal imbalances and digestive issues. Therefore, it is very important to know which foods will nourish your body the most if you follow a vegan or vegetarian diet. Below I’ve listed 8 nutrition tips that you can incorporate into your diet to ensure you have great digestion, energy, clarity and optimal health. 1. Soy is NOT your saviour! Traditionally, soy is a fermented food. Most of the ‘modern’ soy has been genetically modified, and isn’t fermented. This includes such products as:- tempeh, miso, nadu, wheat free soy sauce and tamari. If you tolerate certified organic soy, then it has the potential to be a great protein source, only when it has been properly fermented though. Remove it from your diet for one month and reintroduce it to see how your body tolerates it before you start consuming it every day! 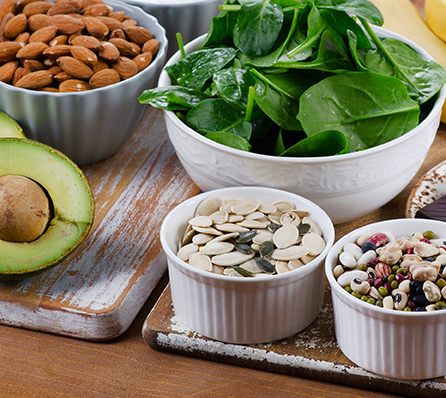 Incorporate high quality proteins in your meals and snacks at least three times a day. The top protein sources for vegetarians and vegans include quinoa, hemp, inca inchi, chia seeds, beans, legumes and a variety of nuts. 3. Do you have trouble digesting legumes? If you do, then the best solution is to ferment them. When you ferment legumes, everything is ‘predigested’ which reduces the work on your digestive system, providing less carbohydrates for your microbes to feed off. The proteins will become more bioavailable, and the nutrients will be enhanced too. If you reheat the fermented beans or legumes the microbes will die, so you will not get the benefit of the probiotics. However you will still have a nutrient dense protein source. The directions for fermenting legumes will depend on your starter culture, however, I’ve included a general guide below. If using organic tinned beans and legumes, go to step four. Soak beans and legumes in filtered water for 12-24 hours with a dash of apple cider vinegar. Cook the beans and legumes according to the type, ideally the longer you can the better it is. Rinse the beans or legumes with water. Place the beans or legumes in a jar and cover with coconut water kefir. Alternatively you can use water and a probiotic or starter. Put the lid on the jar tightly, and allow the contents to ferment for at least 24 hours. You may need to release air from the jar, by opening the jar lid each morning and night. Drain out the liquid and discard. Prepare the beans and legumes as per usual. You can make a hummus, a bean dip, add them to curries, or make a dahl. I recommend serving with lots of fat, such as coconut yogurt as the base of dips, cold pressed oils, or avocado. Zinc is one of those nutrients that vegans and vegetarians are often missing. It is a crucial nutrient, particularly for nourishing the gut lining, assisting in the absorption of vitamins and minerals, for immune system support, to balance hormones, fight diabetes, support liver health and more. It is encouraged to test for a zinc deficiency through your preferred practitioner. If you do have a zinc deficiency it may be worth supplementing your diet with a quality zinc in a liquid form. This will enhance the nutrient bioavailability and make them easier on your digestion. Simply soak nuts and seeds in filtered water with a dash of apple cider vinegar for 6-8 hours, and then dehydrate in your oven at a temperature no higher than 100 degrees Celsius until they are moisture free and crunchy. Saturated fat is essential in our diets, as each cell in our body comprises of 50% saturated fat and is crucial for our brain, cell to cell communicating as well as the production of our hormones. Vegetarians can consume coconut oil, ghee/butter, eggs and vegans can consume coconut oil, cacao butter and sustainable palm oil. Legume based fritters or patties bound with chia seeds if you’re vegan or eggs if you’re vegetarian are a fabulous quick and easy snack. Simply serve these up on a bed of greens, some roasted or sautéed vegetables and drizzle with oil. Green vegetables are micronutrient powerhouses and can become more flavoursome by adding salt, coconut oil, fresh or dried herbs and spices. When you steam vegetables, nutrients are leached into the water so it is best to either roast tor fry them in coconut oil. There is a world full of stunning plants, so make the most of them. Ensure you always prepare meals traditionally, and you will be on your way to having a thriving, energetic body. Enjoy your wheat free journey, make it exciting, delicious and enjoyable. Great article- this has been my experience. Went mostly vegan in January and putting on weight and getting really sore breaky leading up to menstruation. I’ve just eliminated bread (did try sprouted but want to stop all for the moment) trying to limit grains but am not sure which grains are better for me or not. Any advice? Hi there Kirrily, finding out what works for your individual body can be tricky, but the best way to do it is by doing an elimination protocol of some sort. You eliminate the food you want to test for at least 4-6 weeks, then introduce it after that break and see how your body reacts to it, noticing any symptom or body reaction, whether it be a headache, bloating, gassy, sinus issues etc. Also if you want to continue consuming grains we recommend preparing them properly by soaking them in filtered water with a pinch of himalayan salt and apple cider vinegar, then rinse again in the morning and cook. When soaking grains, nuts etc., what is the reason for adding salt and apple cider vinegar to the water? Hi Jade, the apple cider vinegar and salt assist in drawing out and breaking down the phytic acids, antacids and other components that may be inflammatory/inhibit the digestion absorption of nutrients. All the best :)! I read that it’s not necessary to soak all nuts (i.e. cashews). Would you still recommend soaking them? P.S. Great article! Hi Sabrina. Happy to hear that you enjoyed this article! We now have social media pins under each blog so you can easily share with your friends! Can legumes be fermented after sprouting them, instead of cooking them? Thanks Sheridan, that was a really helpful article and am so glad that you have addressed the needs of Vegetarians and Vegans, as I feel that there seems to be a big push towards Paleo being the only way to go. I think eating complex carbs (whole grains, foods that contain fibre) are satisfying because they break down slower, its the fibre that helps with digestion. You have made some great points regarding legumes and grains as they can be difficult to digestion for some people and for me going gluten free has helped a lot.